Classic, unique, and good food from the fire of Scott’s backyard. A million years ago man discovered fire. To say man invented fire is a bit of a misnomer. It’s like saying man invented water or air. Maybe you can argue that he discovered a way to produce fire, but invented, no. I’m still at a loss to figure out why he would put his hunted provisions on it. Maybe it was accidental in its discovery. Caveman Dave left his hunter gatherer score on a hot rock by the fire and was astounded by the smell and aroma that hit his olfactory and taste buds! Basic grilled meats are invented! We should be happy Caveman Dave stumbled on the combination of meat and fire. I think this was bigger than the wheel! When was the last time you ate a wheel? There are so many variations of fire cooking in the world thanks to a discovery a million years ago that we should take a good look at all of them. I’ve been pushing this view because we get locked into the routines of daily life. When I became a single provider I strived to keep it interesting for my kids. We could have lived on take-out, prepackaged frozen concoctions, or bacon and eggs. I’m thankful that my sense kicked in and I decided to take the initiative regarding cooking. I’ve tried to teach them (and anyone that will listen) to take an extra twenty minutes and make the spaghetti sauce, buy the beans and make the chili instead opening a can, make the soup, bake the bread, cut out the ordering in. My twist is the fire. Smoke billows to the sky, smells hit the neighbourhood and I’m outside. The grills take preparation beyond turning a dial to a set heat. They take nurturing and caressing to make sure they keep their temperature and don’t flare. You have to take your time and pay attention. You walk away, things burn, Ovens and microwaves have ruined the art of preparing a meal. 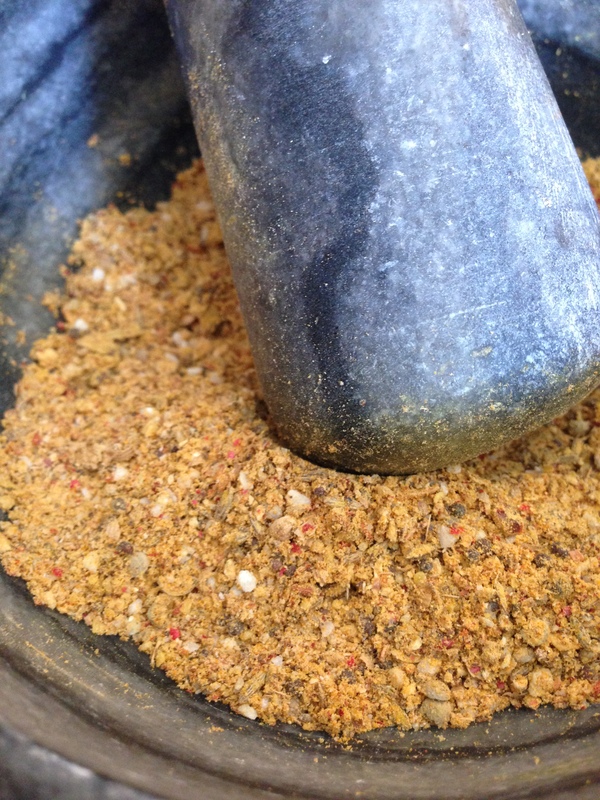 Meat needs a rub, wood has to be chosen, timing has to be focused, and love needs to be instilled. The quote I started this with is something I live by. Life is about timing, patience, and looking forward to what’s coming. Food has been a building block on which I base my daily life. Have an idea of what you want to create, make sure you have the ingredients, and take action. It will either work or not but at least you put your effort into it. Fast food has no soul; it fills a hole but ends up creating a black hole in your nutrition and your life. Cooking, grilling, smoking, all of it takes patience and in the end gives you a sense of accomplishment and a warm hug to those around you. What are you cooking tonight? Does it have heart? Did you put your soul in it? Why not? The Olympics are over. Congratulations to all that participated. Not just the medalists, everybody. Performing on the grand stage is phenomenal in itself. Finding the inner fortitude to compete for your country in a foreign land with all the world watching takes a more than physical strength and commitment, it takes a special kind of person. Well done! So taking the initiative, (on a much reduced scale), I have been stretching my cooking and BBQ skills in a different direction. I’ve been utilizing my granite grills as much as I can to take the mundane to another level. My mandate, as always, is to take conventional produced meals and add some flare, smoke, and fire to them. By this day, most everyone knows what a pizza stone is and either has one or is considering one. Maybe you got one as a wedding gift and it lays dust covered in a cupboard somewhere. 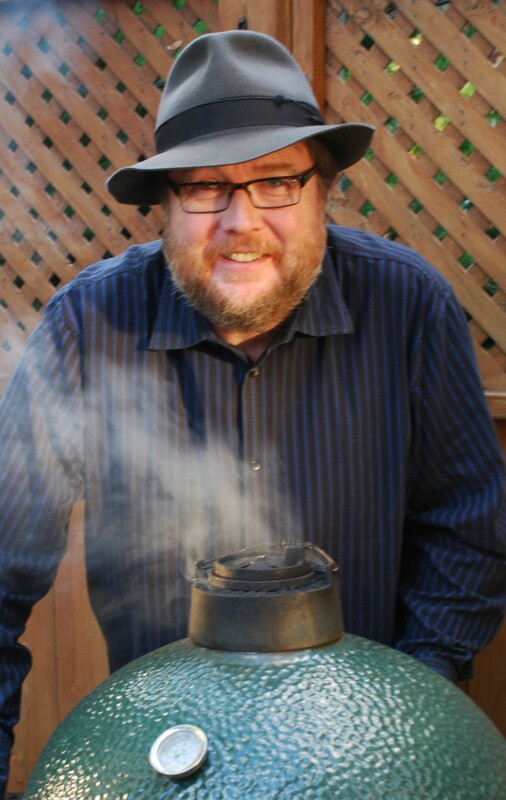 Mine has been used for the aforementioned purpose, but is usually used as a diffuser for my Big Green Egg. The new beige colour is now a deep black. That being said, my new granite grills have taken their place. 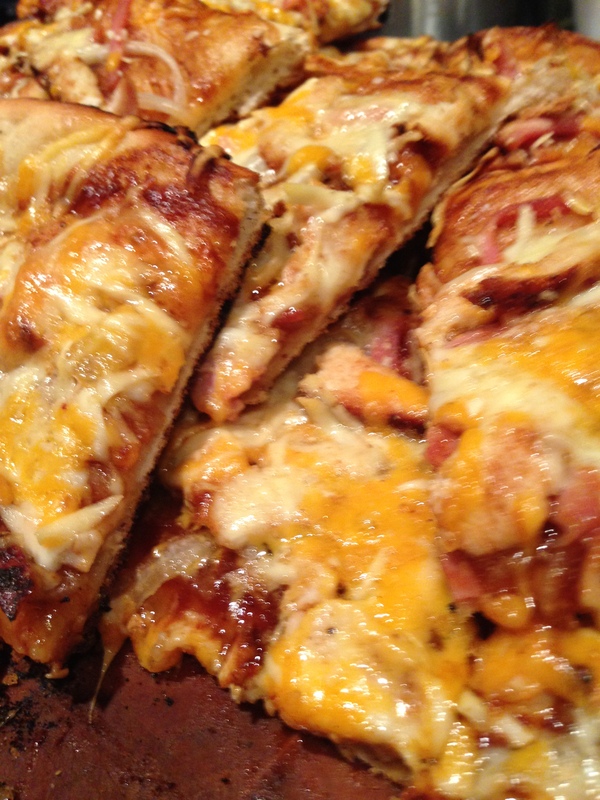 So what better meal to create on my gas BBQ other than BBQ’d Chicken Pizza? My usual shopping included pre-made pizza dough but after some searching on the interweb thingy I found a basic, easy, dough that take no more time than prepping bread dough. In all actuality, that’s what it is. Since I’m making fresh bread at least once a week it was an easy addition to my standard set of tools! When you’re searching recipes add the word “easy” or “best” in front and see what happens! So two chicken breasts seasoned with my basic BBQ rub and grilled over flame, sautéed onions, bacon, shredded Romano and Cheddar on top and store bought BBQ sauce as the base. The grills were put on my gas grill and heated until they were too hot to the touch. The closed lid temperature was 500f. Now the tricky part, get them on without messing tem up too badly. The answer, parchment paper! Build your pizza on the paper and slide it on to the hot grill. 10 minutes should do it but check after 5. If you have one side that heats up more than the other, use the paper to spin them around for even cooking. As always remember, if you’re looking, you’re not cooking. Hot stone grilling is old school in some parts of the world but new to us. North American’s like the tried and true but now with the infusion of foods and flavours from the world the tools are coming along with them. Take some inspiration from the Olympics! Look inside and stand on the podium of your BBQ and as always, have fun with it! 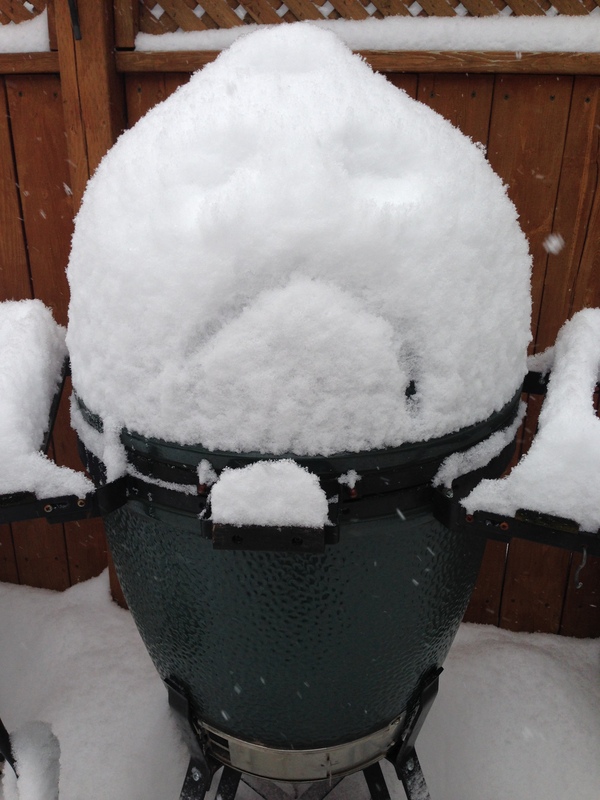 While my Green Egg gently weeps! Every year we hear that something is the new Black, “Blue” is the new Black; “Red” is the new Black. Something is always the new Black. But Black is always hanging on; it’s still the base, the thing that others are judged by. 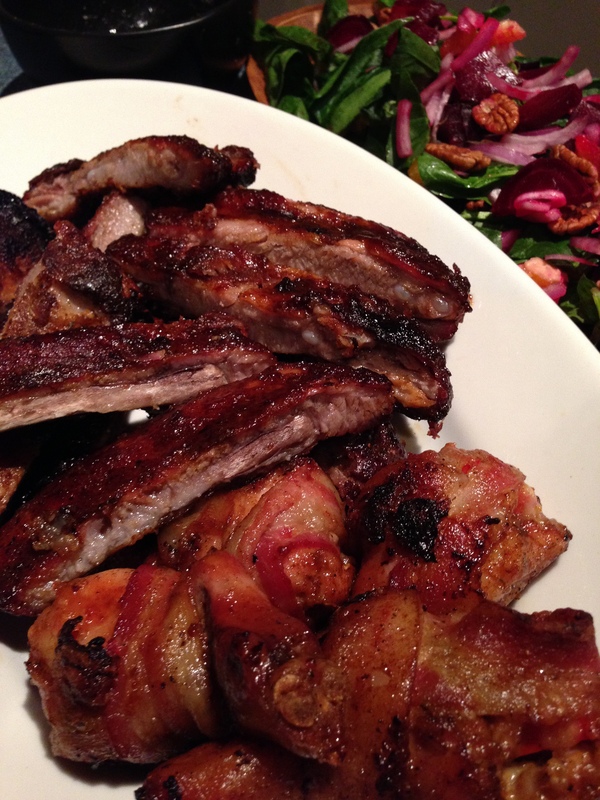 So why can’t BBQ be the new Black? It’s the base that everything started from, cooking food over flame. Meat, I’d like to introduce you to fire, fire meet meat. Black is a neutral. It allows your focus to be on other things and not centered on colour and frivolous components. BBQ for me is the same. Knowing that this is my base, it allows me to concentrate on what is important. The flavor and the taste! It grants me the opportunity to be creative knowing I don’t have to worry about the how just the what. Food preparation should first take place in the mind. In sports, the winners, the champions play the game first in their minds to see all the possibilities and visualize the success. That’s what you need to do with cooking, visualize the achievement, prepare for the work, and work the plan. Getting rid of the superficial and distracting lets you achieve your goal. Think about your creative process like Google maps. Pick your start point, pick your destination, and choose the most direct route. My start point is my BBQ, my destination is the finished meal, my route is the most direct I can find. People stress and fuss over all the little stuff, I don’t. The meal is a journey from start to finish and we are supposed to enjoy the journey in life. So allow BBQ to be your new Black. Let it be the base or starting point of your journey and don’t allow the frivolous colour to distract you. Practicing for the Super Bowl! So the big game is coming up. You’re the guy with the big screen and the beer tap. You’re having way too many people over and you know something is going to get broken, the neighbors are going to complain and your wife has no intent of helping you with the food. 1 Share the bounty. Ask people to bring something along with the beer. Salad, chips, popcorn, veggies (I was made to put that one in) and dip, anything that will lighten your load. 2 More little food is better than big food. People want to snack. Change from burgers to sliders. You don’t want everybody to fill up on one thing. 3 Timing is everything. Work backwards from your scheduled time. Do something low and slow that you can prepare ahead and leave alone to take care of itself. Chili, stew, pulled pork, or brisket. Something that you can prepare and walk away. 4 Only do one thing that needs immediate attention. If your doing wings, burgers, nacho, or something that has to be done at the last minute, have all your prep work done. Have the BBQ lit and up to temp. Have the veggies for the slaw shredded and ready to go for the last minute dressing. Have the beer in the fridge. Get as much done as possible before hand. Planning ahead means more eyeball time on the big screen. 5 Don’t experiment! Go with your strengths. Doing something you’ve never tried before is for later. If you screw it up your chances of getting a pizza delivered to fill that void is slim. Remember this is the busiest day of the year for pizza delivery. I’ve devised my menu on Seattle and Denver plus a little extra. Coffee rubbed brisket with a low and slow smoke served with slaw on dinner rolls. Denver chili over coals because I’m not doing a Denver omelet. Bacon wrapped, jalapeno stuffed chicken legs. I love the option of chicken legs over wings. They reduce the amount of effort when you think about it. The average person will eat 5 or 6 wings but only 1 or 2 legs. When you have a large amount of people it reduces what you’re juggling on the grill. These are started about 45 minutes before anyone shows up but were assembled earlier in the day so they’re good to go for game time. Remember, sharing, bite sizes, timing, prepping, and going with your strengths. Lastly, have an exit plan. Plan on getting everyone home safely or making sure they have a place to stay. The day after the Super Bowl has the largest number of people calling in sick. Did you book a vacation day because your boss knows you’re not sick! Last night was my first time on FanSidedRadio. Pre Super Bowl talk and food ideas for the party. I love Christmas, I become many people during the season. I’m a shopper, decorator, wrapper, host but mostly a father. I don’t look for presents; I look for the reaction to the gifts I give to my children and loved ones. I’ve never returned a gift because it’s given with love. I’ve even kept the unfitting sweaters and shirts because they were given from the heart. OK, I’m silly but that’s me. My favourite role is that of cook. 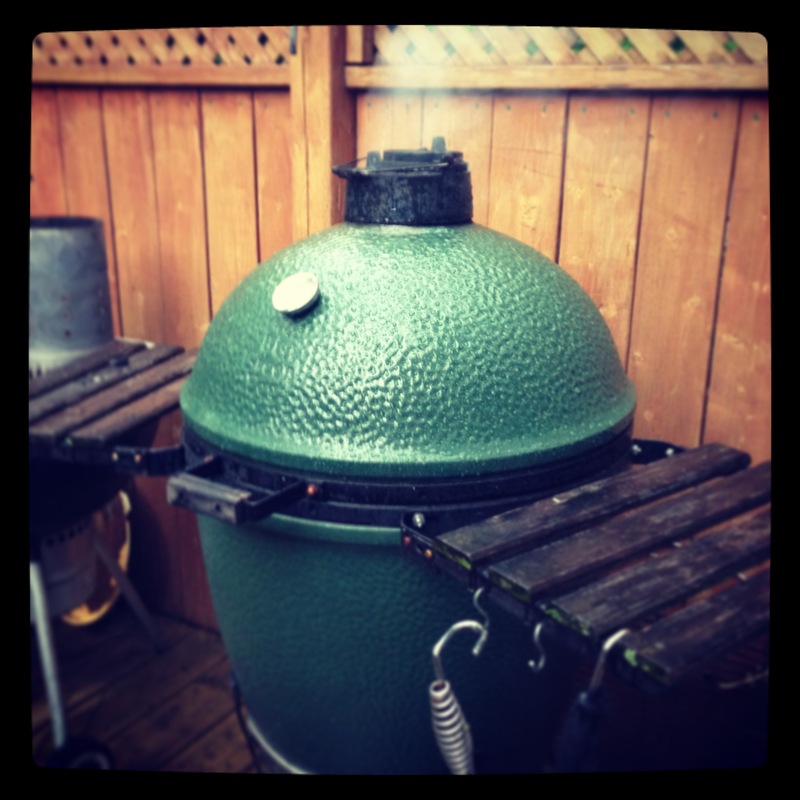 My neighbours see the smoke rising every Christmas morning as I start the Big Green Egg to smoke my turkey. Sometimes the weather participates and then there are other times, like this year. Toronto experienced an ice storm the weekend before and 350,000 homes were without power. I was lucky, my fence wasn’t. But better the fence than the house, or my BGE! Five years ago I experimented with brine for my turkey. I haven’t done one since without. Osmosis is a wonderful thing. It doesn’t produce a salty bird, just a juicy and tasty turkey that will surprise and astound your family. My brine; kosher salt, whole black pepper, brown sugar, 2 whole cut clementines, sage, rosemary, thyme, garlic head, onions, and a little maple syrup for the hell of it. Submersed in a cold brine for 10 hours in a cooler and flipped every 4 hours or so (when I remembered). Rinsed and patted dry and ready for a smoky embrace. Stuffed with onions, garlic, rosemary, sage and clementines. Rubbed with a concoction of butter, olive oil, salt, pepper, and garlic. This year’s choice of smoke, maple wood! Sweet and light! I’m practical with my smoking and realize that I don’t want to spend the day outside so I smoke for approximately 2 to 3 hours on my BGE. I finish inside in the oven. This way I’m paying attention to not only the bird but the veggies too! That and I don’t kill myself by falling on the ice! On transfer to the oven I cover with bacon to add more flavor and moisture. I found if you put it on while you smoke it the bacon holds back the smoke on the areas it covering. It also leaves a weird pattern. Get the smoke to the flesh first. 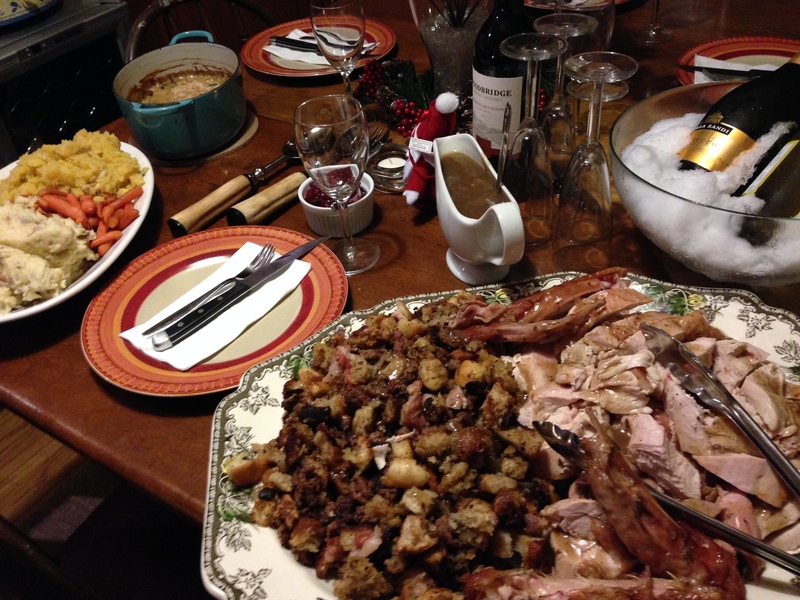 You might notice I haven’t mentioned stuffing. I choose to make mine on the side in a cast iron pan. I take some of the drippings from the pan I had underneath the bird in the BGE and mix them with the stuffing. I make a sausage stuffing. Sometimes duck but this year an artisanal porcini sausage. Wonderful combination! 20 minutes a pound and my 18lb bird was ready in 6 hours but I started checking them temperature after 4 hours. You have to take in account fluctuation in the fire and the temperature outside. Every time you open the lid, you drop the temp. So here’s my bird! Garlic mash, turnip, green beans in a cream sauce, brandied carrots, and sausage stuffing. Too bad Santa had to leave! A little smoke goes a long way! So a new start to a new year! Creating a new direction in life is a journey of expectation, wonderment, possibilities, and fear. I’ve travelled this road for over a year now and lo and behold the future I see is bright. I haven’t travelled this path alone; I have the support and love of everyone I know. In addition I’m travelling it with a few friends that are on their own paths. My concept of taking the indoors outdoors and looking at food as an offering of love and comfort seems to have spread and connected me with like thinkers and food centric renaissance people alike. BBQ, smokers, grills or whatever you chose to call them are just extensions of your kitchen and can be utilized all year. Conventional recipes can be updated to add flair and switched up. How your mother made it is wonderful, but thinks about what you can turn it into if you add your own personality and skill. So now starts the next dimension to my journey. I am now a staff writer for FoodSided.com. 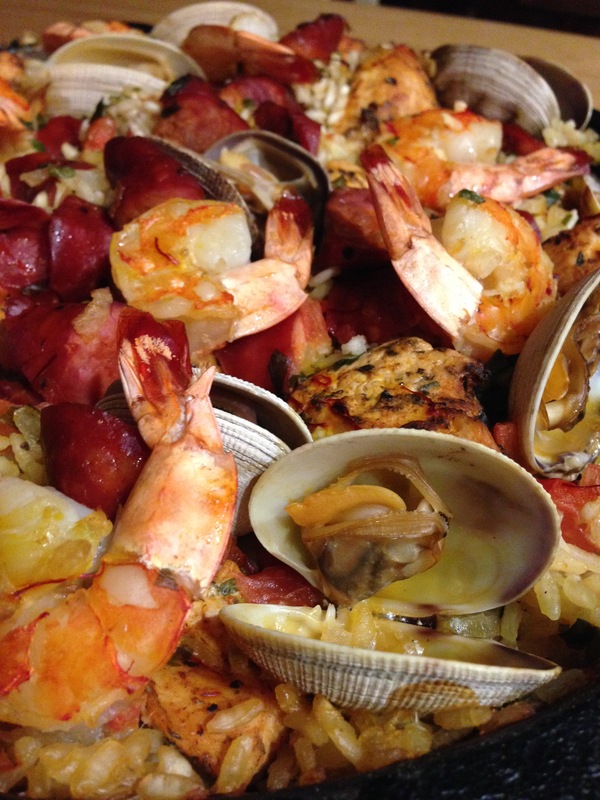 FoodSided is an extension of FanSided which is dedicated to sports and sports bloggers. Taking the same passion from their base site, FoodSided is building to become one of the most popular and searched food sites on the web. I look forward to the experience and the continuation of the journey. I will be posting here and on FoodSided.com along with updates on Twitter and my Facebook page. Please follow and enjoy the journey with me. Don’t cancel your Christmas Turkey people! Take it outside Artisanal Grill Style!! So the weather in Toronto has left us powerless and cold. Reports are in that people are canceling orders for their Christmas Turkeys because they are afraid their electricity will be off and they can’t cook their birds. Hard times call for creative thoughts. One of the concepts that I have been dictating for some time now is that what you can do inside you can do outside. I’ve been planning a step by step on my Christmas bird from brining to smoking, but that’s to come when I start it tomorrow. But for now as a reminder to all you Canadians out there with BBQs, you can do your bird outside. 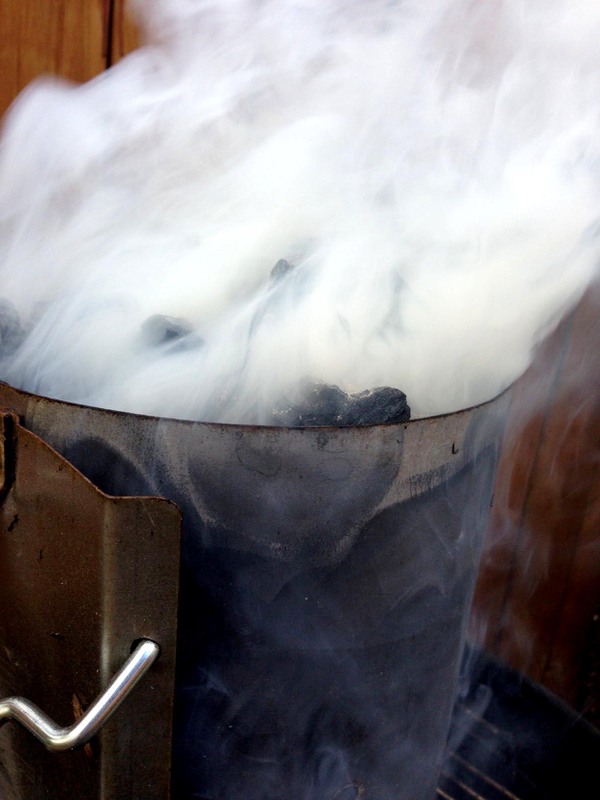 Dust the snow and ice of the grill, get out your camping stove, and make the lady at the convenience store look at you funny when you ask if they have any charcoal while everyone else is buying salt! Make this Christmas the year of the Q! Now don’t be scared. Transform your thoughts of grilling on it. Think of your BBQ as an oven. After all, it’s a heating source. Step 1: Prep your bird as you would but leave out the dressing (stuffing). It’s better to do it separately. Step 3: Place a pan on the unlit area to catch the drippings. This gives you a drip pan. Add water, wine, and whatever else you would place around the bird in the oven. This gives you the base for your gravy. Step: 4 Bring your grill to the proper temperature (350 degrees f). 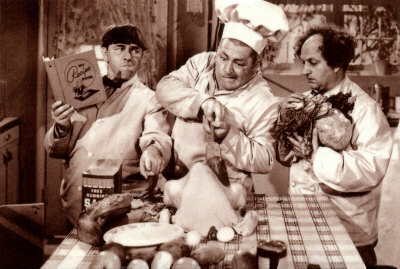 An 8 to 12lb unstuffed bird should take between 3 to 4 hours cooking time. Time can vary by 30 minutes so have a thermometer ready to check internal temperature (165 degrees f). 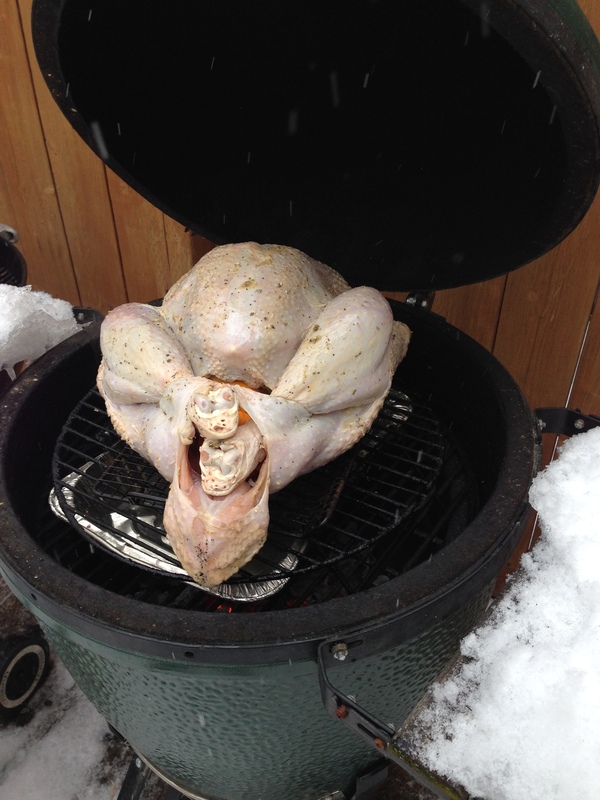 Place the bird breast side down over the drip pan. Step: 5 Rotate your bird every 45 minutes or so to brown and cook evenly. Every grill will behave differently so pay attention and remember if you’re looking, you’re not cooking. Take some of the juices that have accumulated in the drip pan and baste. To minimize open lid time, you can create a secondary baste liquid of heated chicken stock with sautéed bacon and onions. Have it ready to go. So open the lid, turn the bird, baste the bird, and close the lid. Step: 6 Pay attention and follow your bird’s path. Outdoor climate will affect the overall time but with patience you can create a Christmas turkey that will astound your family. The classic French rules say that your cooked bird should stand as long as you cooked it for. I can’t do that but I will let my bird stand for at least 30 to 45 minutes after it’s out of the heat. Cover with tin foil and let the juices work their way back through the meat. If you do this and don’t turn off your grill you’ll have plenty of time to cook your veggies, stuffing, and make your gravy on the BBQ. Remember the camping stove I mentioned? Why not use it too! We’re Canadian folks! Don’t let a little thing like a power outage or an ice storm to make you resort to KD or cold-cuts for Christmas dinner. Take the lead, put on a sweater and get outside!